2 European Directives A European Directive is a statutory act of the European Union which requires member states to achieve a particular result without dictating the means of achieving that result. 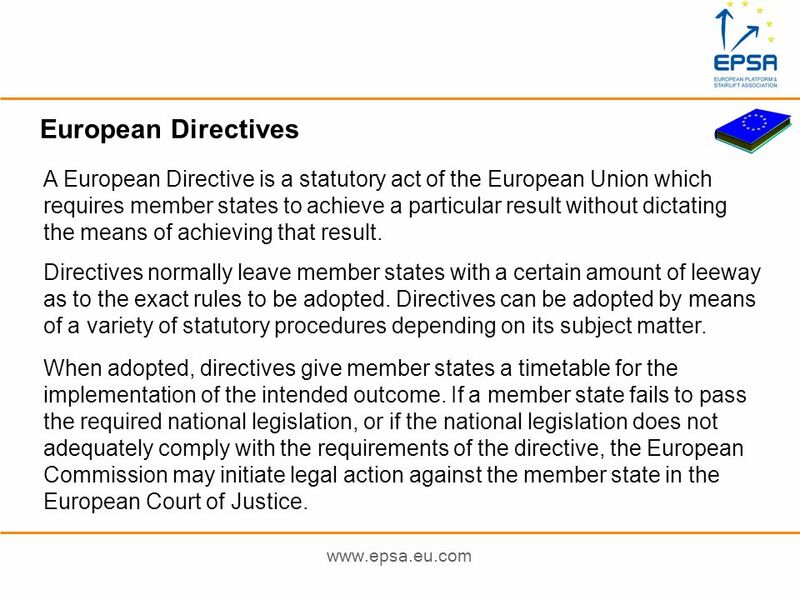 Directives normally leave member states with a certain amount of leeway as to the exact rules to be adopted. Directives can be adopted by means of a variety of statutory procedures depending on its subject matter. When adopted, directives give member states a timetable for the implementation of the intended outcome. If a member state fails to pass the required national legislation, or if the national legislation does not adequately comply with the requirements of the directive, the European Commission may initiate legal action against the member state in the European Court of Justice. 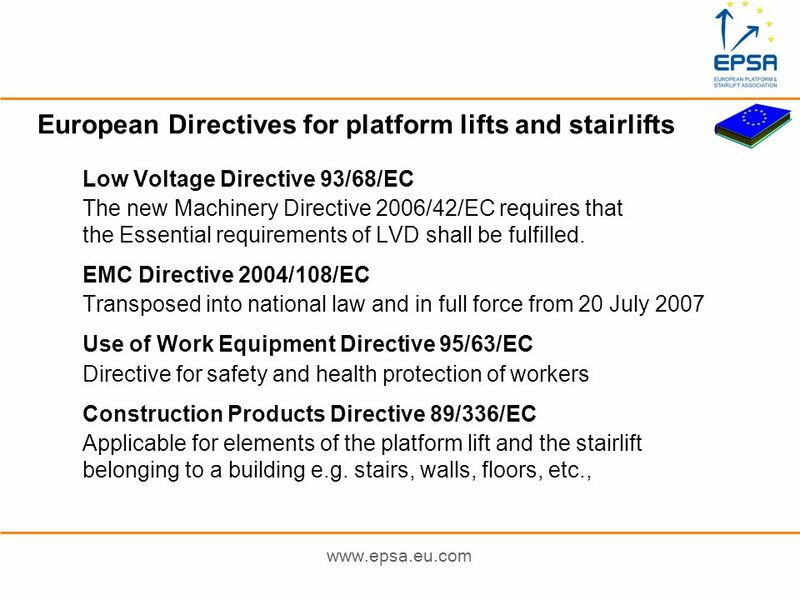 The European Commission, the European Parliament and the Council of the European union have decided that platform lifts and stairlifts fall under the jurisdiction of the Machinery Directive 98/37/EC and will also fall under the new amended Machinery Directive 2006/42/EC. The Machinery Directive 98/37/EC will be replaced by the amended Machinery Directive 2006/42/EC on 29 December 2009. So in legal terms platform lifts and stairlifts are machines and not lifts. 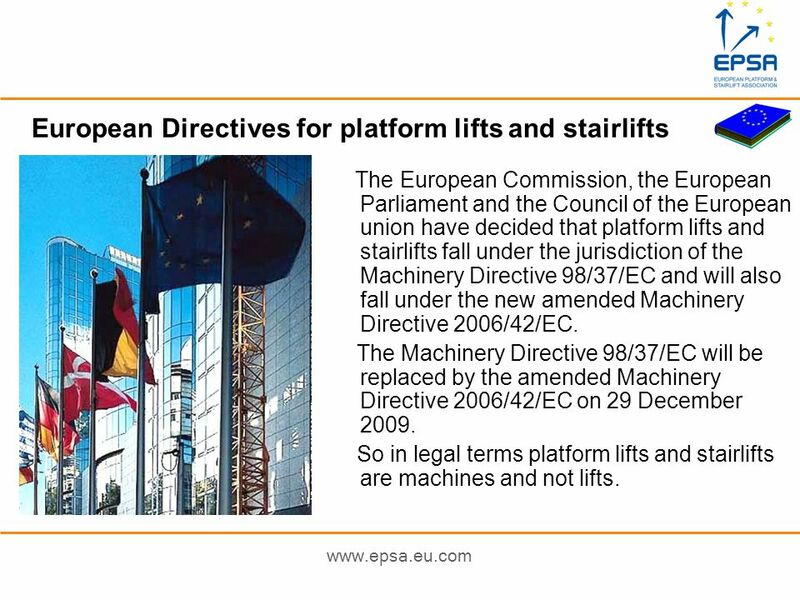 Under the Machinery Directive a platform lift is an Annex IV machine. For travel heights exceeding 3,0 m it must pass an EC Type examination performed by an accredited European Notified body. 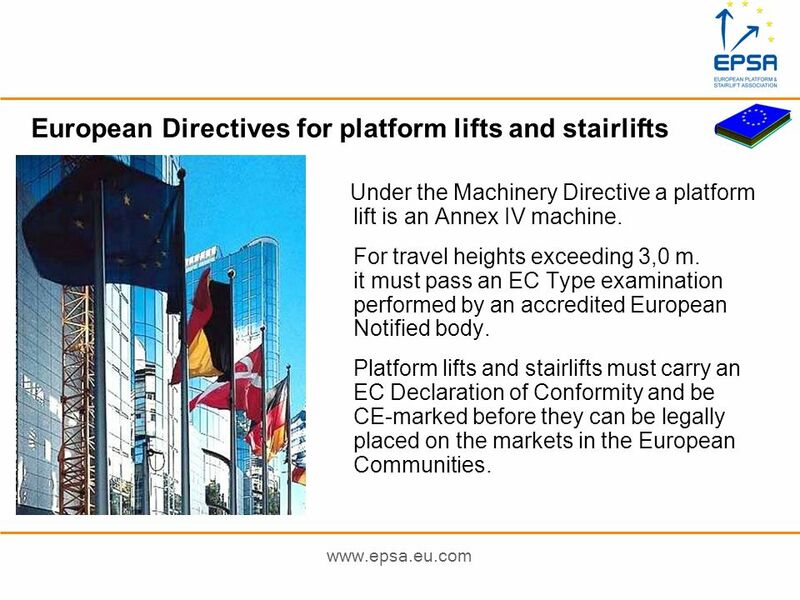 Platform lifts and stairlifts must carry an EC Declaration of Conformity and be CE-marked before they can be legally placed on the markets in the European Communities. 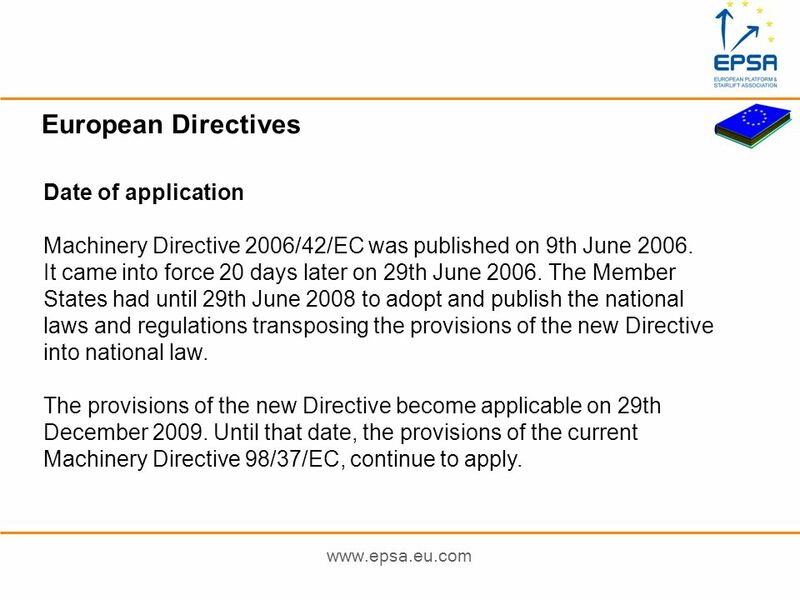 Machinery Directive 2006/42/EC was published on 9th June It came into force 20 days later on 29th June The Member States had until 29th June 2008 to adopt and publish the national laws and regulations transposing the provisions of the new Directive into national law. The provisions of the new Directive become applicable on 29th December Until that date, the provisions of the current Machinery Directive 98/37/EC, continue to apply. 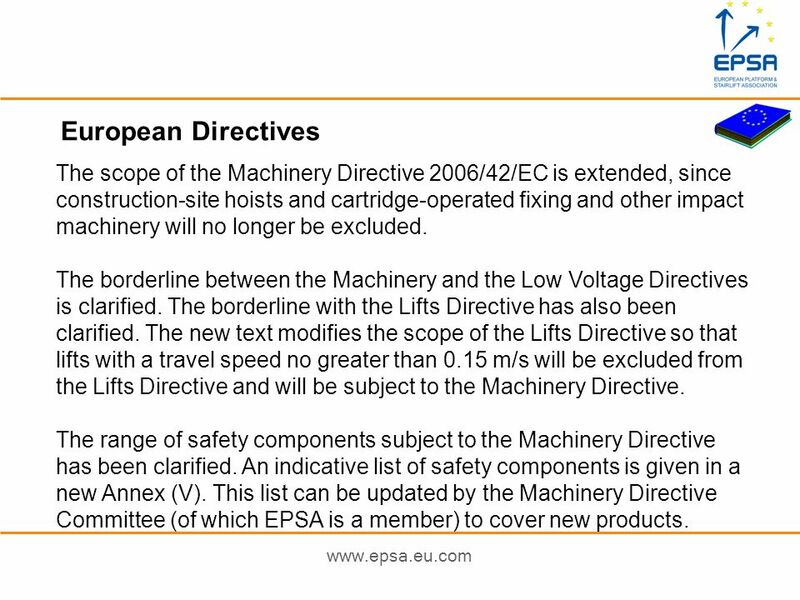 6 European Directives The scope of the Machinery Directive 2006/42/EC is extended, since construction-site hoists and cartridge-operated fixing and other impact machinery will no longer be excluded. The borderline between the Machinery and the Low Voltage Directives is clarified. The borderline with the Lifts Directive has also been clarified. 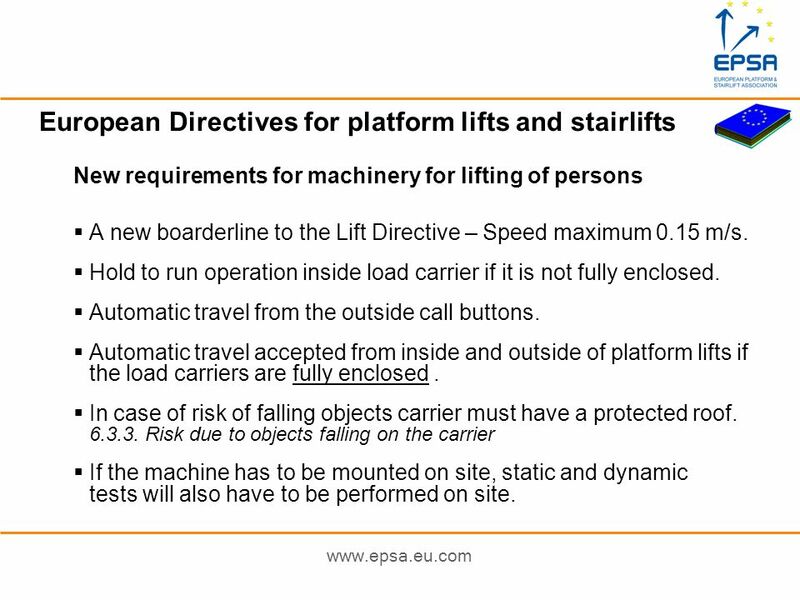 The new text modifies the scope of the Lifts Directive so that lifts with a travel speed no greater than 0.15 m/s will be excluded from the Lifts Directive and will be subject to the Machinery Directive. The range of safety components subject to the Machinery Directive has been clarified. An indicative list of safety components is given in a new Annex (V). 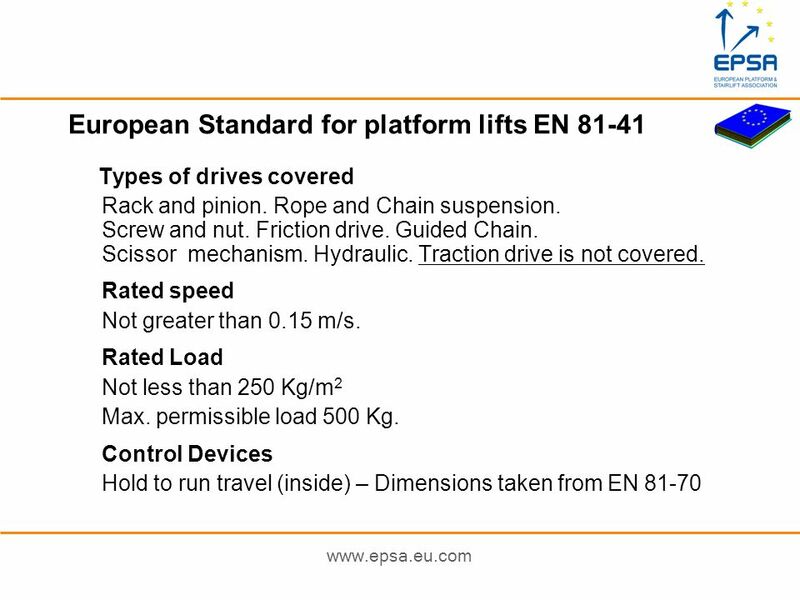 This list can be updated by the Machinery Directive Committee (of which EPSA is a member) to cover new products. 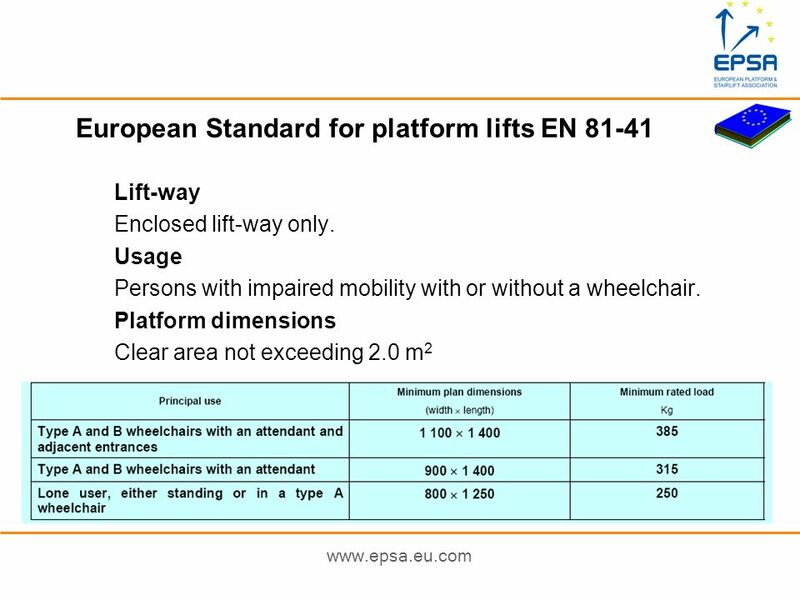 New requirements for machinery for lifting of persons A new boarderline to the Lift Directive – Speed maximum 0.15 m/s. Hold to run operation inside load carrier if it is not fully enclosed. Automatic travel from the outside call buttons. Automatic travel accepted from inside and outside of platform lifts if the load carriers are fully enclosed . In case of risk of falling objects carrier must have a protected roof Risk due to objects falling on the carrier If the machine has to be mounted on site, static and dynamic tests will also have to be performed on site. 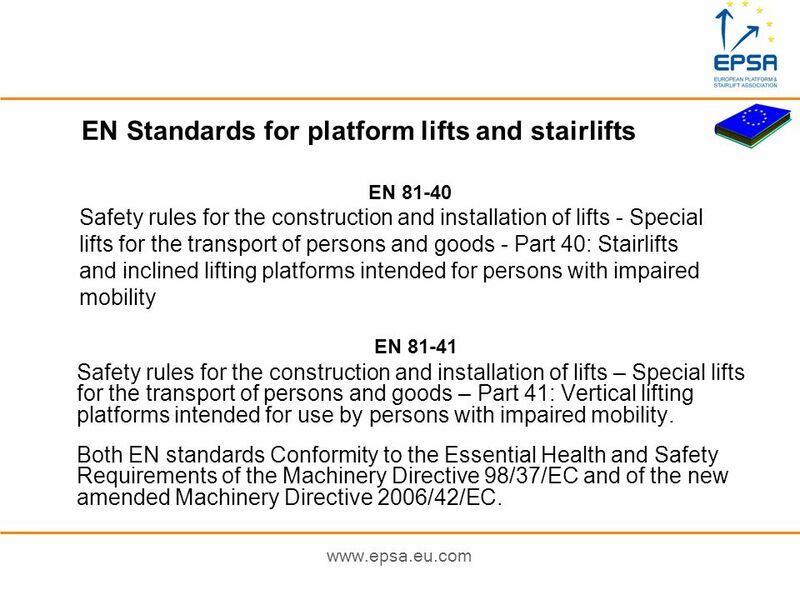 Safety rules for the construction and installation of lifts - Special lifts for the transport of persons and goods - Part 40: Stairlifts and inclined lifting platforms intended for persons with impaired mobility EN 81-41 Safety rules for the construction and installation of lifts – Special lifts for the transport of persons and goods – Part 41: Vertical lifting platforms intended for use by persons with impaired mobility. Both EN standards Conformity to the Essential Health and Safety Requirements of the Machinery Directive 98/37/EC and of the new amended Machinery Directive 2006/42/EC. 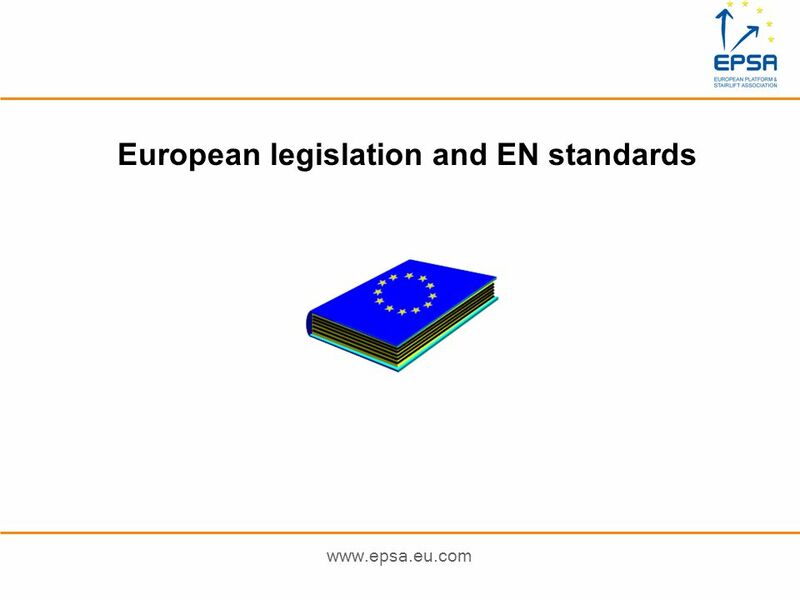 Download ppt "European legislation and EN standards"
It is an electrically powered lifting appliance. It can have an open or an enclosed lift- way. It can have a fully enclosed car or an open platform carriage. European Commission - DG ENV.A CCA Dublin, Ireland CCA Workshop on Safety Reports Tobias Biermann European Commission Environment Directorate-General. European Commission Jacques McMillan Enterprise Directorate-General Legal aspects linked to internal market EUROPEAN CONFERENCE ON MARKET SURVEILLANCE. Enterprise Directorate-General Action at EU level The forthcoming Regulation on certain Fluorinated greenhouse gases EPEE/EFCTC Workshop on Fluorinated. General introduction to the New Approach and CE marking Contribution to workshop in Sofia, Bulgaria on 19 and 20 april 2006 by Annette Dragsdahl, Senior. EN Safety of escalators and moving walks - Part 2: Rules for the improvement of safety of existing escalators and moving walks © ELA | T. Kausel. EHMA bofcon Bo Frank Consulting June 2005 European requirements and practice in heat metering by Bo Frank EHMA. Directive 97/68/EC on the approximation of the laws of the Member States relating to measures against the emission of gaseous and particulate pollutants. Revision of EN81-1 & EN81-2 Background & Current Status Asansor Istanbul 2011 April 15 th, 2011 Istanbul Esfandiar Gharibaan Chairman CEN/ TC10 CEN TC. CE Regulation Service PROLAB Tech Rev 1 Machinery Directive Flow Chart A brief guide. Workshop New Approach – Sofia, Bulgaria – 19/20 April Workshop on New Approach Directives for the Engineering Industry Focus on Directives Regulating.